The goal of the Lexington Training Band is to accurately portray a Massachusetts militia company as it appeared between April 18, 1775 and October 18, 1775. 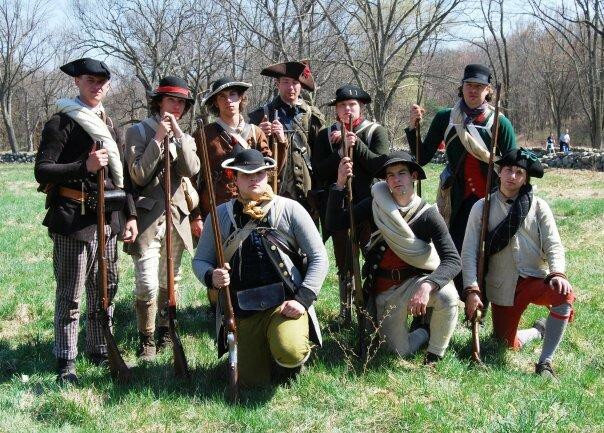 As a result, every member of the Lexington Training Band is expected and, more importantly, required, to accurately portray a Massachusetts militiaman to the extent permitted by up to date research. Wearing outfits made of polyester, sewing plastic or modern buttons to clothing, wearing 18th century clothing uncommon to the Massachusetts Bay Colony, or simply wearing an outfit without a coat, smock or jacket, actually distorts the historical period and events we cherish so deeply. Further, by knowingly recreating clothing and equipment incorrectly, we engage in mis- education and do a disservice to American History. The Lexington Training Band adheres to the “five-foot rule”, the Continental Line's standard for authenticity. 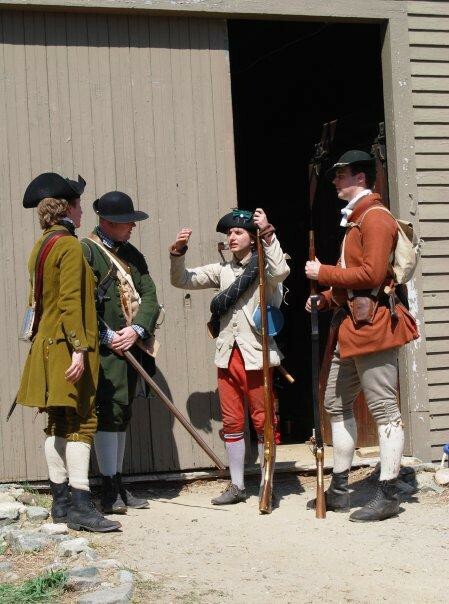 The five-foot rule came into existence in 1988 when the Continental Line was created as an umbrella organization to oversee Revolutionary War reenactments. All member units of the Continental Line are required to follow this rule. 1. Identify or observe any items that are not reproductions of 18th century articles of clothing, weapons or equipment. 2. Identify or observe any article of clothing that is not cut and fit in the proper 18th century manner. “Cut in the proper 18th century manner” is defined as clothing that is produced, cut and sewn so that it is identical or nearly identical to 18th century clothing-patterns and surviving articles of clothing. “Fit in the proper 18th century manner” is defined as clothing worn on the body tight yet not constricted. 3. Identify or observe any 20th century anachronisms, including, but not limited to, modern shoes, modern shoes with buckles tied to them, modern glasses and modern wristwatches. Please keep in mind that under the five-foot rule, the “spectator” is considered to be an experienced reenactor who is able to identify and observe what does or does not look authentic. However, for the five-foot rule even to apply, you meet the required pre-requisites listed above. If your clothing and equipment do not qualify under the five-foot rule, you will NOT be allowed to participate in an event with the Lexington Training Band. The following items are mandatory and must be acquired by members of the Lexington Training Band before they can field with the unit. Failure to acquire these items will result in exclusion from events with the Lexington Training Band. The following items are prohibited by the Lexington Training Band and cannot be worn or carried onto the field. Failure to remove these items will result in exclusion from events with the Lexington Training Band. 18. Hat decorations, including Masonic pins, continental money, clay pipes and feathers. All clothing and equipment must pass inspection. Clothing worn will be properly and well fitted and all visible stitching will be sewn by hand. If you are not absolutely certain of the accuracy and appropriateness of ANY items, please find out before you acquire them. No unapproved clothing or equipment will be allowed. All uniform and equipment items will be changed when changes are necessitated due to new documentation. Members are encouraged to allow their clothes to age and weather in a manner appropriate to life in the field and/or at work. Thus, clothes can/should be stained and patched, but patches should be neatly done and in a manner that allows for preservation of clothes. Absolutely refrain from washing small clothes (shirt and trousers) with bleach or modern heavy detergents. This will degrade the fibres and wash out their natural color. The following are applicable to those portraying male militia men. The proper fit of clothing is paramount. See Appendix A for a discussion of this topic. Dress Uniform hats are prohibited. Caps: Caps must conform to period examples. Acceptable styles include Monmouth caps, French caps, and workman‟s caps. They must be made of wool or linen and be of appropriate colours (striped Monmouth caps are permitted).2 Highland bonnets and voyageur caps are BANNED. Neck Clothes/Rollers: Should be made of linen, linen/cotton blend, or silk and be cut triangular or square. Solid, checked, spotted, or striped colors are acceptable. They must be tied and knotted under the collar. 1 Most commercially available hats/hat blanks are oval blocked. See list of suppliers for makers of period correct hats. 2 James P. McGuane, Heart of Oak: A Sailor’s Life in Nelson’s Navy, (New York: W. W. Norton and Co., 2002), 87. 3 Paul V. Dickfoss, “„white Flannel Shirt,‟ „striped Linen Shirt,‟ „tow cloth Shirt:‟ Shirts of Runaways Advertised in Rhode Island,” The Brigade Dispatch: The Journal of the Brigade Of The American Revolution 34, No. 2, (Summer, 2004). Farmer’s/Waggoner’s Smock: Should be slightly larger than a body shirt and constructed of medium weight linen or lighter weight wool. These can be worn over body shirt and waistcoat or act as an extra work shirt. The length of the smock should be at least at the knee. Thigh and waist length smocks are mid to late war styles and are prohibited. Button arrangement should be the same as for work shirts. Natural, striped, solid, or checked colors are acceptable.6 Work Shirts are not to be used in place of a coat or jacket. They are for fatigue duty only. A lightweight cotton, osnaburg or linen work shirt from JAS Townsend is not an acceptable substitute for a smock. coats cannot be worn at events recreating an engagement prior to October 1, 1775. 6 Cain, “A Frock and Trowsers, Spade and Hoe, Will Do For My Remaining Days: An Analysis of the Use of Farmer‟s Smocks by Massachusetts Militia on April 19, 1775,” New England Rev War Campaigners, 2008. 7 Henry M. Cooke IV, “Unlined Frock Coat,” Historical Costume Services, 1999. 8 Cooke, “The Massachusetts Bounty Coat of 1775,” Historical Costume Services, 1992. Great Coats: Great coats must be made of wool, have a collar and at least one circular shoulder cape sewn into the coat. Cuffs should not have buttons and must be long enough that they may be turned down over the hands. The coats should have six to eight buttons down the front. Breeches: Breeches must conform to period examples. They must be fall front style and should fit closely about the legs. They should be made out of leather, wool, linen, or fustian. Breeches may be solid, striped, or checked in pattern and colour. The most common colours for wool breeches were blue, black, brown, and “light.” Other colours are also acceptable. Ties, buckles, or buttons may secure the knee-bands. Acceptable buttons include pewter, brass, horn, wooden, or cloth-covered.11 White canvas breeches are prohibited. Trousers: Must be fall front style, above the ankle in length, fit relatively close above the knee, have a baggy rear seat, and adjustable ties in the rear. Trousers may be solid, striped, or checked in pattern and colour. Fabrics may include wool, linen, linsey-woolsey, or fustian. Buttons should be pewter, brass, horn, wooden, or cloth-covered. Gaiters or Half/Farmer's Boot: These should be made out of linen canvas or wool in black or brown. They should close with pewter or horn buttons, and extend about eight to ten inches above the ankle. Gaiters should be tight fitting and not sag. They must cover the laces or buckles of your shoes. Military style high (full) gaiters or Indian leggings are not appropriate for the civilian militia impression. 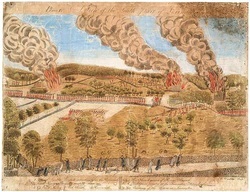 9 Dickfoss, “„striped Flannel Jacket,‟ „blue coarse jacket Kersey wove,‟ „an old brown Broadcloth jacket‟: Jackets of Runaways Advertised in Rhode Island,” The Brigade Dispatch: The Journal of the Brigade Of The American Revolution 32, No. 2, (Summer, 2002). 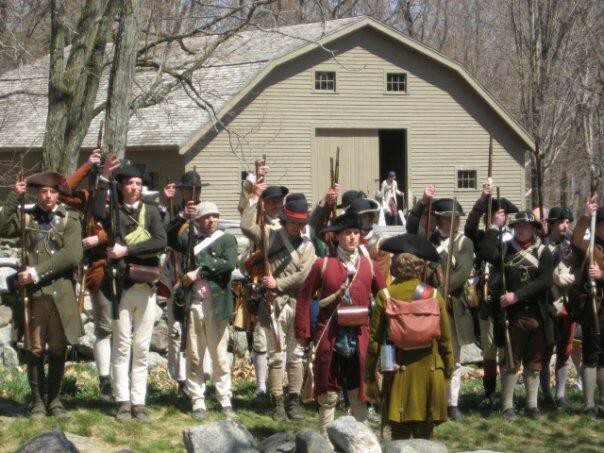 Also see Cooke, “The Massachusetts Bounty Coat of 1775,” Historical Costume Services, 1992. Cold: Men‟s & Women‟s Outerwear in America, 1750-1800,” Historical Costume Services, 2010. Advertised in Rhode Island,” The Brigade Dispatch: The Journal of the Brigade Of The American Revolution 35, No. 4, (Winter, 2005). Island,” The Brigade Dispatch: The Journal of the Brigade Of The American Revolution 31, No. 3, (Autumn, 2001). Footwear: Should be plain, mid 18th century style leather shoes. Leather may be black or brown, smooth or rough side out. They should be closed with buckles (brass or steel) or laces.